Rosey’s love for farming began when she spent time at her uncle’s farm as a young child, she felt happy and content on the farm and knew very clearly that it was what she wanted to do. After school she couldn’t get on to a farm and so worked at a point to point yard, at this stage Rosey met her husband and they decided they wanted their own farm. Together they hoped they would meet the criteria of experience needed to land their dream job. However, there were many obstacles still in the way and due to lack of experience Rosey and her husband struggled to get a farm in Yorkshire, repeatedly turned down the couple were beginning to loose heart. As well as running a busy farm of over 200 beef, sheep and arable, Rosey is also a champion of Ladies in Beef – something she feels strongly about. 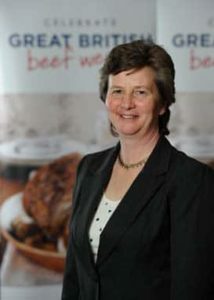 Ladies in Beef was co­founded by two beef farmers, Minette Batters and Jilly Greed, who hold a passionate belief that the general public has a right to know about the people producing their food, the exacting standards, and the high quality and care that these farmers maintain.